We see the party making its way back to Grezneck, travelling at night through the dripping jungle, crossing the river in silence, and loosing itself in the mist maze of the Alder King. Later, we see Necoare asking for an audience with Tribitz, then we see the goblin high priest speak with Necoare as jets of flame belch forth from holes in the ground flooding the cave in orange hellfire. Truly, the name Flames of Orcus is well earnt. Nobody is witness to their discussion. Slowly our eyes move on to a different cavern about twenty miles to the north east. Time slides back, the sun rises in the west and sets in the east as we rewind, a day, two days, a third day, and we see a gnome, being led down into darkness. Behind the gnome is a large four armed demon. At first, there is no sound, and blackest night swallows the gnome and the demon as the evil red heartbeat disappears in the distance. But then, in the blackness, we hear steps. Rumdin is making step after step, down, into the heart of stone. A muffled scream is heard from the depths below. We see the stairs ending in a corridor illuminated by torchlight. Doors and courtains to the left and right hide the rest of the tunnels, but the gnome soon reaches a great cavern reaching 100 feet in height. Several large pillars are formed of joined stalactites and stalagmites. 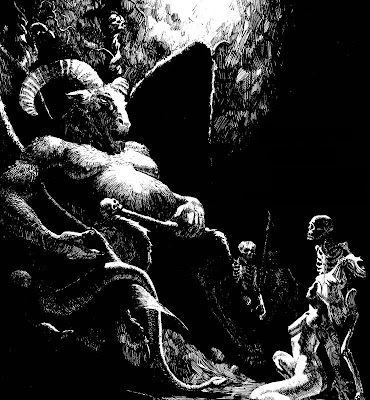 The cavern is dominated by a huge statue of the demon prince standing upright and holding his wand above his head, his batlike wings fully spread. Surrounding the statue, which towers some 30 feet tall, are a number of bronze braziers filled with coals that give off a hellish glow. Behind the statue are great brass portals. In front of the statue is a rough black pit filled with bones. The cave is filled with a handful acolytes, some zombies, an ogre is disappearing down a tunnel. As four armed demon enters this cavern, the torches flicker and all heads turn. When they see the hapless gnome, an evil grin spreads and the acolytes approach. A door opens, and a priest emerges. He, too, starts to smirk.